1. Being a prolific author, where do you get ideas for your many books? I literally get them from everywhere! They come from television, from classic radio programs, from everyday conversations to reading history. Whenever the ideas come, I write them down in either logbook or on whatever paper I can find. I have more than fifty church bulletins with book ideas jotted down them. So the ideas come easily, but it is the actual writing that is the tough work. 2. As busy as you are, what activities help you relax, reenergize or refresh? Being around college kids, we have two universities in our town, really gets me fired up. I read a lot, restore antiques like jukeboxes and classic cars, I watch college sports (even do play by play for basketball), like to hike and run and we have dogs and cats. Two nights a week my wife and I have date nights. 3. How long have you been married and do your sons plan to follow in your footsteps? I have been married thirty-eight years. Kathy is a professor in the education department at Ouachita Baptist University. I doubt either of my sons will end up in this business. For starters they have seen how demanding it is and that would likely scare of them off. Plus it is just not one of their interests. One of our sons has never even read one of my books, so that kind of shows that he is not inclined to follow in my footsteps. The other one reads my novels but has a much different vocational bent. 4. What writing projects are you currently working on? Well I am constantly working on the different episodes that are required for the In The President’s Service series. I also have two regular novels, one a romance and the other a comedy whodunit I am writing for Abingdon. I have a devotional book that just came out and we will be doing a sequel to that. I have novel with a legal theme that comes out in 2014 and a nonfiction book on dog heroes. Who knows what else will fall into my lap? 5. Do you have a favorite classic car? How did you begin in this hobby? I have had an old car dating back to the first year of our marriage. 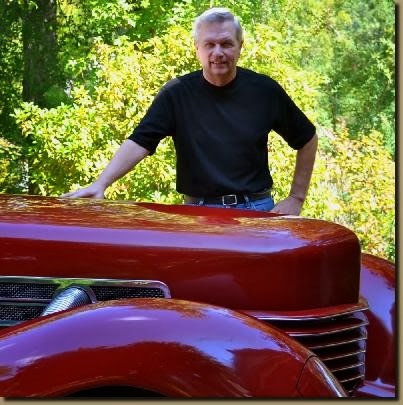 Our first two were a 1954 Chevy pickup and a 1941 Ford Club Coupe. The two that I have now, a 1965 Mustang Fastback and a 1934 Auburn 652Y sedan, are very special to me. The Mustang has been in our family for a long time and both of our sons drove it during their high school years. The Auburn is a largely unrestored car that I drive a couple of times a week. To be into its eighth decade it is an amazing vehicle. It runs so well and the art-deco styling is simply perfect. To me it is like rolling sculpture. 6. What would someone experience if they were to shadow you during a “typical” workday? I usually edit and rewrite in the morning, as well as do my office work, then in afternoon I actually write. I quit for the day when I burn out. That might be five or it could be two in the morning. In truth, when I am in the writing mode I am rarely aware of the passage of time. I will write a chapter and then rewrite it a few times then move onto the next. I do break from time to time and when I do I usually listen to a classic radio program from the 1930s or 1940s. The writing in the mysteries and detective shows is so sound, driven and on pace that it inspires me to get back to work. 7. Do you read or study the Bible daily? As I write and give a lot of devotionals I have to, but usually the study comes not when I read a selection, but when I am driving or walking. That is when I put what I read into perspective. 8. What is your favorite time of day for quiet time? It is whenever I am in my car, so it varies. When I drive I rarely turn the radio on and just kind of tune into my thoughts and search for my calling and the wisdom needed for that day. When I drive I also think about (pray) for those I know who are struggling.